Roaming Stamper: Spring is HERE! 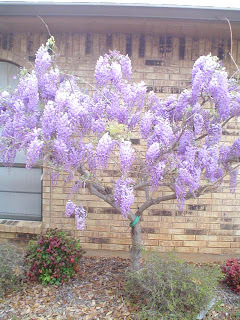 Ok, so I know spring officially began on March 20th but to me spring is when my wisteria comes into full bloom. I snapped these pictures this morning because I love my wisteria tree. It's one of the first things we planted when we moved into our home about 10 years ago and every spring I enjoy the beautiful blooms and wonderful scent it provides. The thing I love best about my wisteria is that after it's first "big bloom" it will bloom many, many more time throughout the spring and summer! That's pretty unusual for a wisteria but oh so lucky for me!. 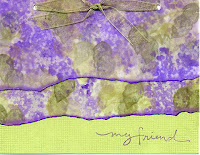 Seeing my wisteria this morning reminded me of one of my favorite Stampin' Up! sets, Blossoms Abound. There was much debate when this set was first released. 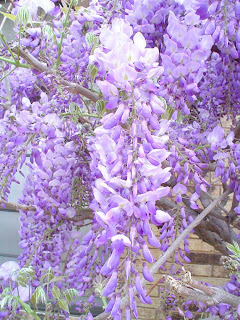 Many thought it was grapes, some thought it was a lilac but couldn't figure out why the stem was pointed the "wrong" directions, but I knew the minute I saw it that it was wisteria blossoms. Whether or not that's what the artist had in mind when he/she drew it, it's what I've always used it as. Here is one of my all time favorite cards I created with this set. All products from Stampin' Up! Card was created with two layers of torn vellum cardstock with blossoms and leaves stamped randomly on the vellum and then layered onto the card. Enjoy spring everyone...while it lasts! I couldn't agree more...I LOVE Blossoms Abound, it is my favorite SU floral set ever! My favorite non-floral SU set ever was Old Glory and I am still waiting for them to come out with another that I will love as much. However, I was drawn to make a comment first to tell you that your blog looks GREAT and I loved the photos from your trip to the Nat'l Park...beautiful photos, what a great SB you will have. I can already see you scrapping the photos of your husband by the tree with the Lovely As a Tree set. Don't forgot to journal about how you had to lay on the ground across the street to get it all in. Anyway, lilacs are my favorite so when I stamp Blossoms Abound, I do it so they look like lilacs and my lilac bushes are trying hard to get blooming, they are looking good and if all goes well I will have tons of blossoms, maybe by my anniversry which is perfect timing.